I recently had an opportunity to grill Wendy White, Project Manager for Team Australia, about her experience with FullCodePress last month. 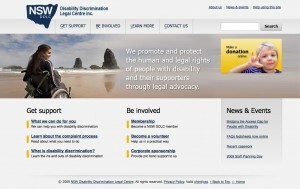 Wendy’s team was tasked with building a website for NSW Disability Discrimination Legal Centre. While her team didn’t win the competition, the final product (done from start to finish in 24 hours) was pretty impressive! Here are the highlights from my interview with Wendy, including how she and another member of her team competed while fighting the flu, and how she used her “not unremarkable” array of martial arts skills to support her teammates! Alyssa Gregory: Tell me about your role on your team. Wendy White: I was the Project Manager. I guided team discussions and planning, and tried to keep everyone sane, unhassled and productive during the competition. When I applied for the role, I assumed that most of it could be performed prior to the competition during our preparation process. My plan was to get a solid timeline set up, and then give us an edge during the competition by doubling as an extra team member in whatever area needed the most work done. This was somewhat premature as it turned out the project management kept me fully occupied throughout the entire competition! So there you go. Turns out Project Management really is a full time job after all! AG: Were there any challenges with the team dynamic? WW: There were no real personality conflicts – we did have the opportunity to converse via email for a week or so before the competition – but getting our working styles to mesh together was tough. Normally, you would learn about a team’s style over time – who works best with regular personal check-ins, who needs motivating and re-focusing, all that stuff. There was no opportunity for that. We had to adapt to each other’s way of doing things on the fly. Keeping everyone sane during the great dramas was a bit tough. Like the wireless network continually dropping out due to all the CeBIT traffic causing our CMS to save over completed content with corrupted half-saves, but my team rose to every challenge! Everyone had a great attitude, and now that we’ve worked together once, I’d find it a lot easier to manage the team a second time. At the end of the competition, everyone was unanimous – we wanted to have another go! AG: Tell me about the client you worked with. WW: Our client was the NSW DDLC – quite a mouthful. 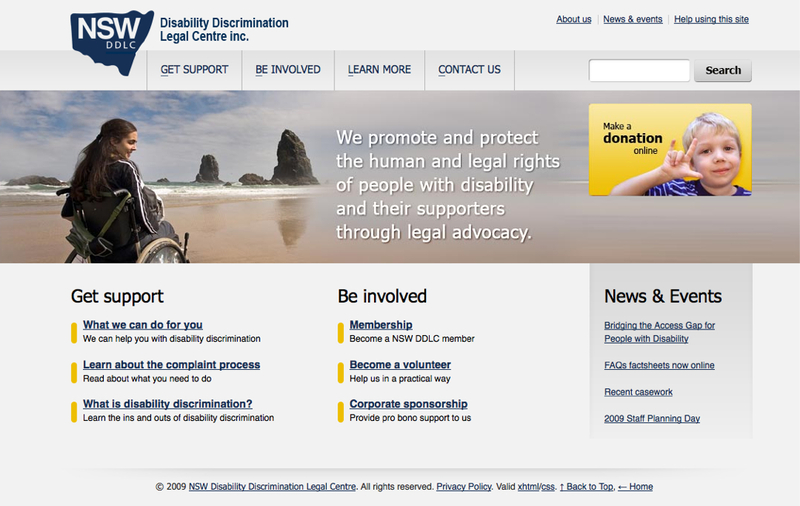 That stands for the New South Wales Disability Discrimination Legal Centre. They provide an overwhelming amount of resources and support for people with disabilities, and their supporters. The client had an existing website, but the design and IA needed a complete overhaul, and there was a lot more content to be added. The two representatives from the DDLC, Natalie and Peter, were fantastic. Both were very enthusiastic and had clearly put a lot of time into thinking about the website prior to the event. Peter is deaf, so we had to communicate with him via an interpreter. However, the interpreter was only available for a handful of hours during the day, so we ended up relying on other means of communicating for the majority of the competition. He is actually a very skilled lip reader, which made life a lot easier. He was a real champion, staying with us until 5:00 am in order to answer any additional queries we had while we were working on the website – and he was back again by 9:00 am! We were very fortunate to have him around for such an extended time. Natalie was very generous and brought us all kinds of sugary pick-me-ups to keep us going throughout the competition. We had to be careful not to indulge in those too much, though, otherwise we would have been shaking too much to do any work! AG: How did you tackle the hurdle of creating your client’s visual identity in only a few hours? WW: Well, we were very lucky to have Rhonda, Patrick and Alexi on the team, as their considerable experience helped keep that process focused and efficient. They had a very intense discussion session with the client after our initial general group discussion and were able to get some very good information early on about what would work. Our client’s brief was “serious, business-like, but hopeful” and I think the design of the site embodies that perfectly. Due to the fact that people with visual and motor disabilities would be using the website, making the site accessible to them with clear menus and large areas to click on were a must. AG: Did you follow your usual process? Any shortcuts taken? WW: VERY no and VERY yes! This was an artificial, compressed way of doing things and as such a lot of our normal processes just wouldn’t work. One of the biggest challenges for us was attempting to work on all areas of the site simultaneously, when normally there would far less overlap. Trying to keep everyone busy but not allowing anyone’s work to stop others from getting things done was a tricky business. Elle, for example, made effective use of her time setting up the CMS, a basic template and patching up security holes while she waited on the design from Alexi. Alexi searched for source images while Patrick and Rhonda reviewed and shuffled the website’s IA. We couldn’t take things to the depth we’re normally able to during the development process. We also had to be very severe with our “must haves” and “nice to haves” list. I know every shortcut taken hurt Patrick in particular – he’s a fantastic user advocate and it was hard for him to have so little time to asses the site audience’s needs. Alexi also didn’t want to hand over the template for Elle to code until he was 100% happy with it, but if we did it again we’d probably do a quick and dirty version for coding first before spending time on the polish. My team are actually adding a few extra things to the website over the next month, because there’s things that we just can’t leave undone even though they had to be cut from the original website due to the 24-hour timeframe, such as creating an option to view the website using a high contrast style sheet. AG: How did you handle the sleep deprivation? WW: Surprisingly, we actually drank almost no coffee and only had small amounts of sugar throughout the night. We knew that we couldn’t rely on getting one huge hit of energy every few hours – the repeated sugar/caffeine crashes would wreck us too much in the long haul – so we opted to eat a lot of whole, unprocessed foods along with the occasional Tim Tam. Not standard geek fare, I know, but we had to think like endurance athletes for an event like this. AG: What tools or processes did you use to stay organized during the competition? We had all initial plans mapped out on a private blog, although we mostly referred to that at the beginning of the competition. We used a lot of sticky notes. Our timelines were made of sticky notes on butcher’s paper. Our IA was constructed by shuffling sticky notes around. It felt like our brains were piles of sticky notes by about 6:00 am. We also used the whiteboard to keep track of the results of our most recent “group huddles” that we had every couple of hours, and we emailed each other frequently so that we could keep each other up to date without having to break our concentration during an important task. I tried to meet with individuals periodically so that I would have an idea of where everyone was at all times. I also tried to provide regular updates on our progress via Twitter, to try and balance the reporting – there were far more tweets about the competition from NZ supporters than there were from Aussies, which was a little disappointing. AG: What was one of the biggest challenges for you personally, and how did you overcome it? WW: Both Patrick and I had the flu during the competition, which made thinking a little bit more like wading through syrup than we would have liked. Being on display on the CeBIT floor was tough, too. The Aussie team lost the coin flip so we got the open-air booth while the NZ team got to have a few walls around them. A huge amount of my time was taken up answering questions from punters on the floor, and it would have been great to have had a PR person on the team whose sole job was to answer the questions from the 38,000 attendees and share our progress on social media sites in a positive fashion. I found it quite frustrating that whenever both teams did something right, someone would tweet or blog about it, but only mention the New Zealanders! I overcame the flu (as did Patrick) through judicial use of painkillers and Lemsip. The 38,000 CeBIT attendees – well, I just tried to minimize the amount of time they spent distracting my teammates by using my not unremarkable array of martial arts skills. PM PUNCH! The PR issues I overcame by slowly becoming a twisted and bitter creature, until all that was beautiful within me withered and died, replaced by the cruel and cynical woman you see before you today. I now have a bright future ahead of me in marketing! We all came out of Full Code Press having learned a lot from such an intense, condensed experience, and we all agreed that we’d do it again in a heartbeat – after a month’s rest, anyway. AG: Thank you so much, Wendy! 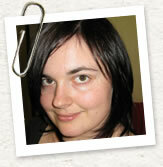 Wendy White is the Online Project Developer at Scitech, an interactive science museum in Perth. She has been programming since she was ten years old, and she still thinks Notepad is cool (actually, she’s moved on to Notepad++). Just don’t talk to her about Java. Her passion for technology and design is only eclipsed by her passion for organizing people and projects. She has six years of experience working with not for profit organizations, and worked as a science communicator, puppeteer and tour guide before moving into web development after graduating from her Multimedia degree at Murdoch University. 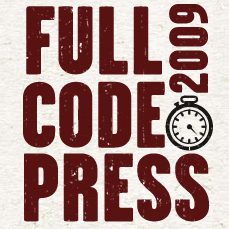 FullCodePress is a web competition started in 2007 that pits one team of Web professionals against another as they compete at the same location to build a complete website for a charitable organization in 24 hours. For more information, visit http://www.fullcodepress.com.